For those of you who own portable backup generators, you really need to test them out on a regular basis to make sure everything’s running well. Running a test is important for other reasons as well, since its also a good time to educate the rest of your family so that they can fire things up themselves should you be unavailable when the power goes out. 2. Connect a portable load (we use a space heater) to one of the 120V outlets. This stabilizes the generator RPMs if its “hunting” which many do when there’s no load. 3. plug the custom 60′ power cord into the 30Amp outlet. 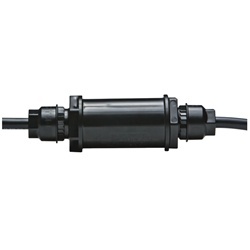 5. plug another extension cord into the outlet and connect it to the sump pump. 6. go back upstairs and plug the refrigerator into the kitchen outlet. I’ve been saying for quite some time now that “global warming is about more energy in weather systems”. But what does that mean from a practical perspective? In short, it means that we can expect our weather to intensify. Temperature swings will become more extreme and storms will become more intense as global average temps rise. Here then is the first of a series of posts that just might help you to prepare for this. Do you own a standby generator? If you do, that’s a great first step, but that step alone won’t help you to keep warm if you lose power in the winter. There’s a simple solution to this however! Your natural gas furnace only draws about 900 watts peak and that’s easily handled by most backup generators. But how can you connect it safely and legally? The answer is also simple: convert it to a corded appliance. Now, when grid power is unavailable, you can unplug your furnace from the wall outlet and plug it into your backup generator. Here’s an article that shows how to inexpensively DIY the conversion. I did ours over the weekend. Cost of Health Insurance: $656/mo for family includes 320/mo HSA contribution. I’ll update this blog as time progresses….. stay tuned! What’s popping up in my news feeds thanks to the Climate Change conference is incredibly interesting! Here’s a new energy storage system now being tested off Lake Ontario. Makes sense given all those wind turbines we saw travelling through the Windsor area last summer! Essentially, renewable energy sources run a compressor that pumps air into the system through one pipe. A turbine is powered by compressed air coming from another pipe providing constant AC power. An inter-cooler system harvests cold air exiting at the turbine to cool pressurized air entering from the compressor. This would negate thermal loss. What’s interesting about this technique is the fact that Boyle’s law dictates that the pressure output will be constant regardless of the actual volume of air in the balloons. This is a real game changer! There are a number of permutations on this design that would make it feasible for many different applications. Consider the simple construction of an underground vertical bore whose top sits below the deepest portion of a nearby pond/lake. In this bore rides an airtight piston. Water from a nearby pond is piped to the upper portion of the bore, above the piston, while compressed air is stored in the lower portion under the piston. When pressurized air from the compressor side of the system is pumped in, the piston rises higher in the bore. Conversely, when this same pressurized air is siphoned off to drive the turbine, the piston in the bore lowers. Net pressure on piston seals is zero so the design can leverage existing and inexpensive technology. A different (and even easier) way to do this would be to simply cap the bore at the top with the compressor/turbine pipes. Water from the lake would enter from below and initially fill the entire bore. Pressurized air delivered by the compressor would lower the water level in the bore, while pressurized air used by the turbine would raise it. In this design, some sort of safety system would have to be developed to prevent water from entering the turbine tube if demand outstripped the system’s storage capacity. I’m currently doing some feasibility calculations on this design. How big must the system be to power a house? How big for a microgrid? 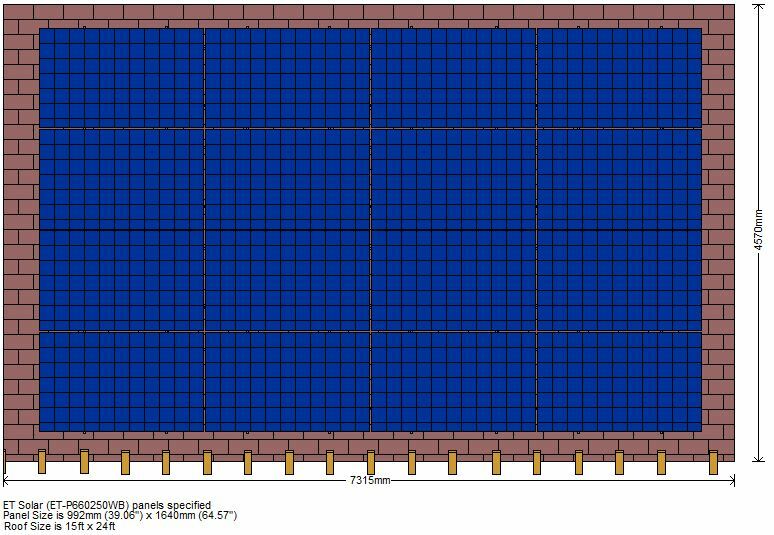 How does available water depth impact system sizing? I found this article while surfing the web today. Sadly, the utilities themselves who could be embracing/profiting the most from this technology are actually the ones who are trying to squash it the most. By building a smart grid that can autonomously store and deliver energy, they should instead be setting themselves up as the primary providers of a next generation infrastructure that would support the intermittent nature of most renewable energy sources. We need geographically distributed renewable energy because the Sun is always shining somewhere. Come on WE Energies! Stop squashing renewables with draconian tariffs and help me hook up my rooftop solar array for the good of our larger community! Oh, and make some money while you’re at it too. Here’s the article from The Verge. Follow the link for more great material! Earlier this week, during a disappointing Tesla earnings call, Elon Musk mentioned in passing that he’d be producing a stationary battery for powering the home in the next few months. It sounded like a throwaway side project from someone who’s never seen a side project he doesn’t like. But it’s a very smart move, and one that’s more central to Musk’s ambitions than it might seem. To understand why, it helps to look not at Tesla, but at SolarCity, a company chaired by Musk and run by his cousin Lyndon Rive. SolarCity installs panels on people’s roofs, leases them for less than they’d be paying in energy bills, and sells surplus energy back to the local utility. It’s proven a tremendously successful model. Founded in 2006, the company now has 168,000 customers and controls 39 percent of the rapidly expanding residential solar market. 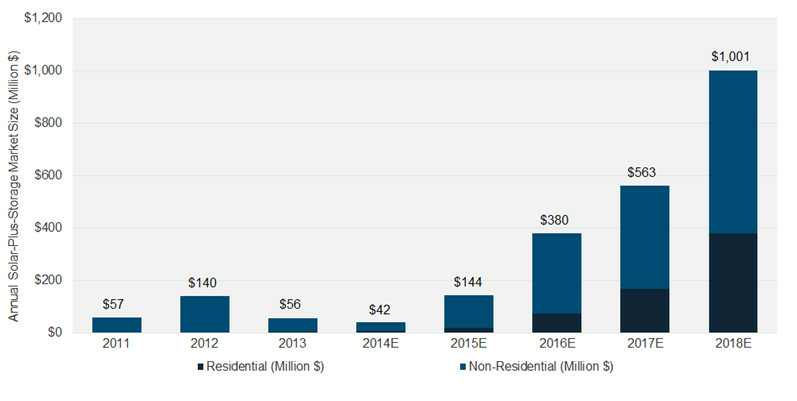 Fueled by financing systems like SolarCity’s, government subsidies, and a rapid drop in the price of photovoltaics, solar has been growing fast. But with that growth, some of solar’s downsides are coming to the fore. Obviously, the sun isn’t always shining when you need power, and sometimes the sun is shining when you don’t need power. The former is a problem for the user, who needs to draw on the grid when it’s cloudy or dark; the latter is a problem for the grid, which needs to find a place for that excess energy to go. When there’s a lot of solar in the system, it can get hard to keep the grid balanced. That’s part of the reason that California, with one of the most aggressive renewable energy mandates in the country, recently declared the most aggressive energy storage mandate as well, with a goal of 1.3 gigawatts of storage by 2020. As other states adopt intermittent renewables like solar and wind, they’ll need to install energy storage too, providing a ready and waiting market for Tesla’s batteries. Forecast storage market from GTM Research. This has been part of the plan for the Gigafactory all along. At an event in New York last fall announcing plans for SolarCity to build a gigantic PV-panel factory, Musk and Rive mentioned that every SolarCity unit would come with battery storage within five to ten years, and that the systems would supply power at a lower cost than natural gas. Those batteries will come from the gigafactory, currently being built in Nevada. Once the factory comes online, the strong demand for energy storage will allow it to immediately ramp up production and achieve economies of scale. Tesla CTO JB Straubel (who has said that he “might love batteries more than cars”) says that the market for stationary batteries “can scale faster than automotive” and that a full 30 percent of the gigafactory will be dedicated to them. Indeed, SolarCity has already begun installing Tesla batteries, mostly on commercial buildings like Walmart stores, which have to pay higher rates when they use lots of power during peak hours. Tesla’s batteries let them store up solar power when they don’t need it, then use it when rates are high, shaving 20-30 percent off their energy bills, according to Ravi Manghani, an analyst at GTM Research. SolarCity is also running a pilot project with 500 homes in California, according to the company’s director of public affairs, Will Craven. The project uses Tesla’s 10-kilowatt-hour battery packs and can power homes for about two days in the event of an outage, Craven says. The prospect of cheap solar panels combined with powerful batteries has been a source of significant anxiety in the utility sector. In 2013, the Edison Electric Institute, the trade group for investor-owned electric companies, issued a report warning that disruption was coming. “One can imagine a day when battery storage technology or micro turbines could allow customers to be electric grid independent,” the report said, likening the speed of the coming transition to the one from landlines to cellphones 10 years ago. Suddenly regulated monopolies are finding themselves in competition with their own customers. They haven’t had to deal with this on the residential side yet, primarily because people can sell excess power back to the utilities at fairly high rates — a practice called net metering. But that’s hurting utilities, too, and some have tried to lower the price at which they buy back power, which has been met by furious protests from people leasing panels. If utilities lower the buyback rate too much, however, and batteries get cheap enough, people may just unplug from the grid altogether — or more likely, install systems that let them rely on it only rarely — prompting what those in the industry call “the utility death spiral.” It’s quite a bind: by fighting net metering, utilities would help make battery storage more economically viable, driving the transition to a distributed grid. Manghani believes utilities aren’t doomed, but they may undergo a radical transformation, becoming something closer to service providers and minders of an increasingly distributed grid rather than the centralized power producers they are today. Such a system would require lots of batteries to help balance the load and supply extra power during peak times, which is why GTM estimates the market will grow from $48 million today to about $1 billion in 2018. Another potential bright spot for utilities is Tesla itself. If electric vehicles take off, demand for power will go up, helping compensate for people whose homes are relying less on the grid. All this is very good news for Musk, who starts to look less like a carmaker and more like the architect of a vertically integrated energy company, with SolarCity making solar panels that send power to Tesla batteries, both in the home and on the road. WE Energies to Squash Distributed Renewables with their latest rate case. For our 4KW installation, that will be $222/year or 1/3 of our total production. Their current advertising campaign paints us as customers who “don’t pay their fair share for the grid”. After netting out my solar, my current electric bill still averages about $200/month. Anyway, our contribution to the docket which is 5-ur-107 on the Wisconsin Public Service Commission web site pretty much sums up the reality. Feel free to mine the data yourself at the 5-UR-107 Document site. I am a DER provider here in Wisconsin, currently billed under the COGS 8 rate tariff. I own a 4KW PV system that was commissioned in two phases. 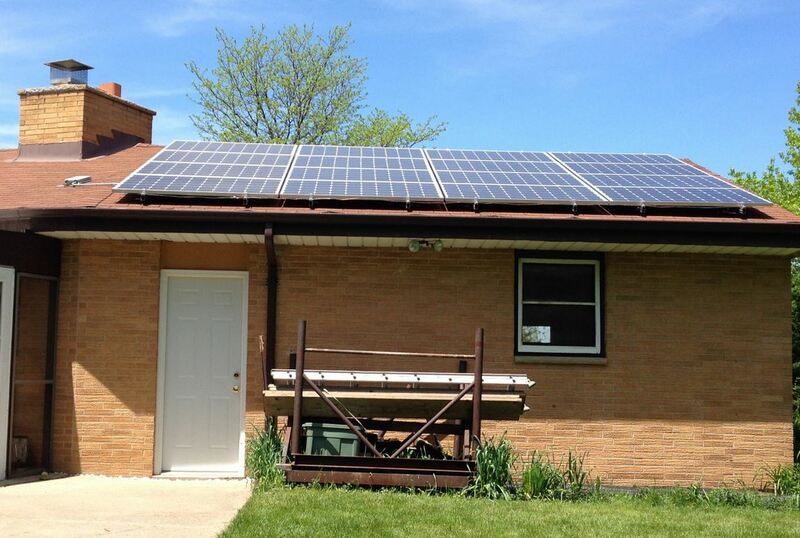 The first 1KW array went online in August of 2013 and the additional 3KW was added in June of 2014. First, let me say this: I get the basic point. As a DER provider on the CGS8 tariff, I am allowed to use the grid like a huge battery. It eagerly absorbs my excess energy and net metering allows me to draw back from that battery when I need to at no additional charge. Every year the battery is “reset” and I am paid .04/kWh if its value is greater than zero. However, my CGS8 rate tariff was granted to me based on the fact that this wasn’t likely to ever happen. So what is that battery worth? There are two studies that shed light on this in the docket’s document list. One commissioned by WE Energies themselves back in 2009 (rebago-25 in the document list) concluded that excess DER production is worth about $0.15/kWH to Wisconsin Electric over my array’s 30 year lifetime. Another, commissioned by Duke Energy in NC (attachment in renew-int-20 in the document list) showed that the total cost of DER PV production is between $1.43 and $9.82 per mWh of PV energy. This is primarily due to the fact that the generation fleet must be constantly cycled up and down to balance the grid during high DER production. According to PVWatts, my 4KW array can put out 5.2mWh/year. So, using worse case I get 9.82 * 5.2 = $51.06/year and using best case I get 1.43 * 5.2 = $7.44/year. That’s what WE Energies spends to balance my excess generation according to the Duke study. The .15/kWh cited in the 2009 WE Energies study is harder to quantify. It is based in part on the fact that the excess energy from my house directly powers my neighbors during peak sunlight and WE energies still gets to charge them peak rates. Our local step-down transformer never even sees a negative current flow during this time because overall net energy still flows towards the customer. WE Energies is realizing this credit whenever the instantaneous energy flow from my house is negative. Consequently, I would argue that the value itself is not 0 over the course of a year, but does represent some credit against the $7.44 to $51.06 yearly cost. Therefore, at worst case, based on the two studies in the docket, I owe WE energies something less than $51 per year and at best case, WE Energies may actually owe me a credit. Instead, WE Energies proposes to charge me $221.95/year using the proposed COGS-NM tariff (I won’t be eligible for COGS-NP because I have a parallel meter configuration). This is not only 4 times higher than the worst possible case above ($51.06 + $0 credit for excess generation) but is also about a third of the total annual electricity that my array produces ($725/year according to the PVWatts calculator). Additionally, this percentage will actually go up as my array degrades over its 30 year lifetime. How can this be considered fair?? Why is WE Energies demonizing me in their advertising campaign promoting the new rates? I run only a 4KW DER facility that I paid 11K out of pocket to install. I absorb all ongoing maintenance. WE Energies gives me no quarter for that. The Energy I produce is carbon free and counts towards Wisconsin’s renewable energy target. Why am I being made out to be the monster not paying my fair share of the grid in their advertising eyes? In conclusion, I would urge the commission to reject the COGS rate proposals. Additionally, since DER PV facilities such as mine represent only a small percentage of the current energy mix, there is time for a more careful consideration of the situation. Based on this, I would also urge the commission to request a fair, unbiased, and in-depth study from a non-involved third party. This study should take into account all viewpoints and would be specifically focused on Wisconsin’s unique Energy perspective. I believe that Wisconsin needs to focus on creating a smart grid with an inherent ability to autonomously store and distribute excess energy. With such a grid, DER facilities throughout the state can take large scale advantage of variable yet renewable resources to the benefit of all Wisconsin energy consumers. My original design called for surge protection and I was getting sick and tired of powering down the array every time the weather looked threatening. So I decided to remedy the situation before leaving on a two week vacation. SPDs or Surge Protection Devices work by shunting large transient currents to ground. Transient currents on normally energized wires occur when lightning strikes near power poles. This increases the electrical potential on high voltage wires carrying current to the step-down transformer or on low voltage wires downstream of the transformer. Transient currents on neutral wires occur when lightning strikes within a few hundred feet of the physical array itself. 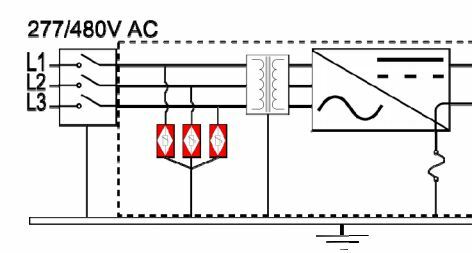 This creates an electrical potential difference between ground (which has its reference at a spike near the the service entrance) and neutral which is bonded at the main panel but has its primary reference at the power plant (because it is derived by the step down transformer). 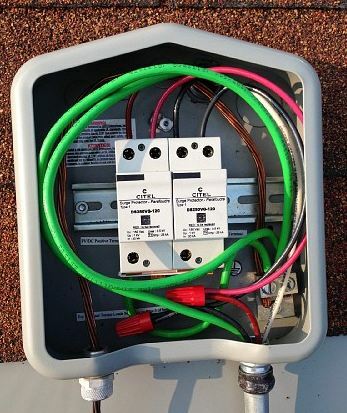 The closer SPDs are to the protected area the better so we specified a Soladeck roof mounted junction box with built-in flashing for our through-the-roof connections. Here’s a shot of it. This is a DIN rail equipped, AC only interconnect box that also ties grounds on an internal bus for the array’s external ground connection at the supply meter. Those features made it just about perfect for my SPD connections since they would run to the ground tie itself and also mount on the internal DIN rail. So, what to protect on my 240 volt split single phase array? Obviously the two hots need to be included since lightning strikes somewhere in our local power distribution network are quite possible. In fact, I’ve had this happen three times in the 10 years I’ve lived at this home. But what about neutral side protection? Well, first let me explain the remedy. To provide neutral side protection would require a GEC or Grounded Electrode Conductor running between the Soladeck junction box and a new set of ground stakes driven into the ground very close to the array. GECs need to be continuous with no removable splices, so the actual process to run the thing would be complicated in and of itself. Now this connection would have the additional benefit of protecting the array from direct lightning strikes but really, in our region, the probability of that is pretty low. Finally, Neutral protection SPDs themselves are really rare (expensive). So I decided to protect the hots only using two Citel DVS52VG-120 SPDs. From a physical design perspective, these SPDs are pretty cool. The upper two connections are actually tied together internally which pretty much means that the installer can simply cut a hot wire then connect the two ends directly to the SPD itself. This generally eliminates the need for external splices. Additionally, Citel devices can be ordered in different paired configurations. In the split phase pairing shown at left, two SPDs come with a pre-installed external bus on the bottom connectors. This means that only one wire needs to be run to the grounding bus bar. As required by the NEC, each DS52VG also has an internal fuse to protect against a short to ground failure. If it blows then indicator lights on the top glow red. 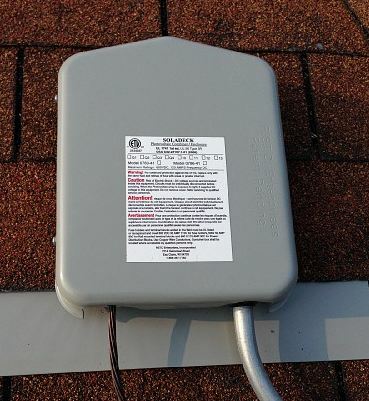 Of course, its not convenient to go on top of the roof after every storm to check this, so the DS250-VG also has an SPDT switch that can be connected to external indicators using low voltage wiring. You can see these in the picture. In my case, I still had to run a splice on each hot because I forgot to tell my installer to loop the wires inside the Soladeck junction box. Ready to do it yourself? 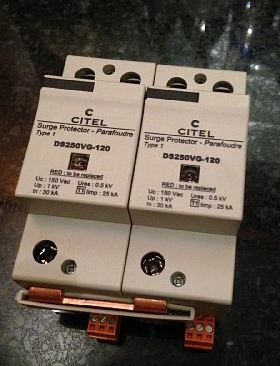 Here’s the DS250-VG Datasheet and here’s the Enphase take on lighting and surge protection. Finally, here is a very good white paper called Protecting Electrical PV Systems from the Effects of Lightning by Solectria Renewables. Have fun with your own SPD design! Here’s the final breakdown for our Solar project (minus the required occasional trips to Home Depot…). The bottom line is really quite good if you ask me! Do your own research on this then consider DIY Solar. Its time! 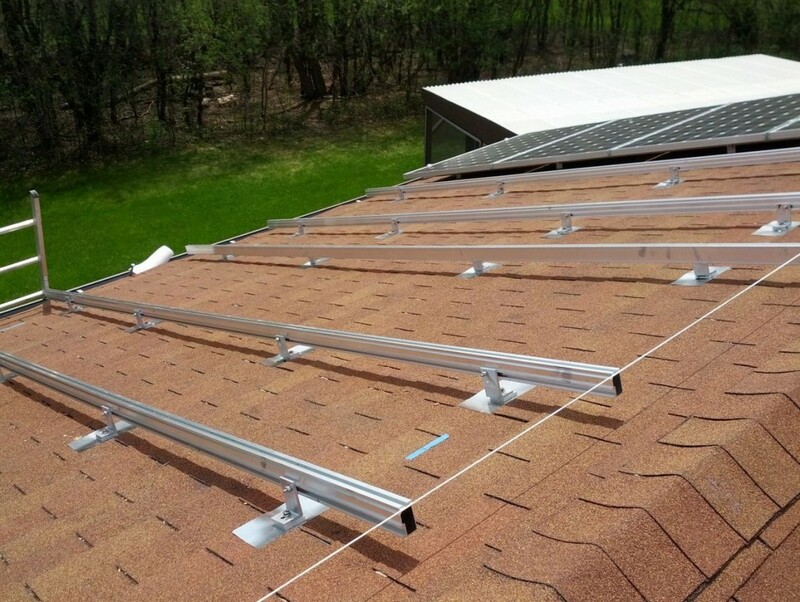 Click on the “Solar” category at the right for a complete chronological view of this solar installation series. The 3 KW expansion required the addition of 6 more Renusol racks. Each pair secured four 265W Suniva panels. 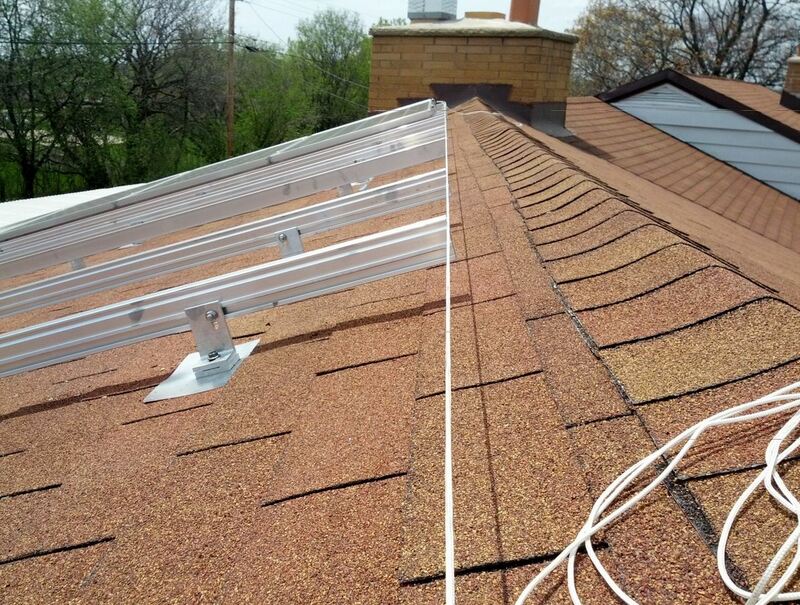 The rails themselves were fastened to the roof using EcoFasten GF flashing at 4 points. Every other rail landed on an existing rafter. As with the 1KW project, I used 4X4s between rafters for the others. 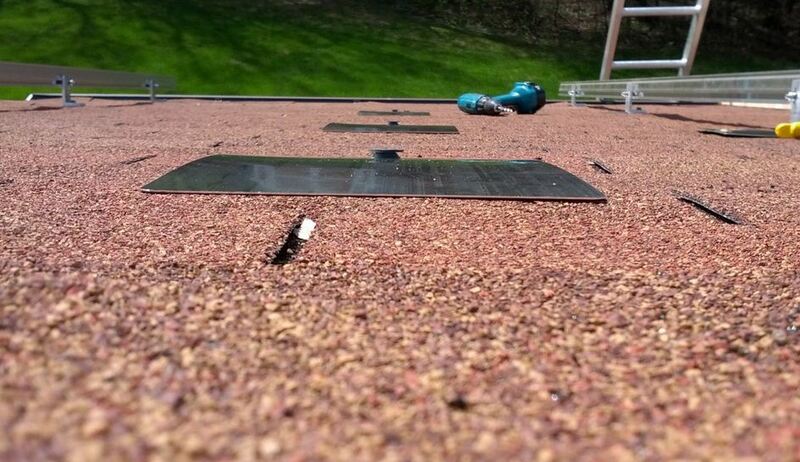 When all was finished, the south facing garage roof was completely covered with modules! So how to do this…. With everything lined up, I drilled 1/4″ pilot holes into the rafter, cut and fit the flashing assemblies into the roofing shingles, installed rail brackets and secured with SPAX lag bolts. The process for the non-rafter aligned rails was identical. However, once the 1/4″ pilot holes were drilled through the roofing deck, I went underneath the roof again and installed 4X4 cross braces wherever daylight showed through… On the bottom of the non-rafter rails, I cheated and left off the almost impossible to install cross brace, instead using a through bolt and large backing washer. In two days, I had everything mounted. From a sequence perspective, I installed the rack closest to the edge of the roof first. This allowed me to stretch alignment string between the top and bottom so that I could build out a flat array on an undulating roof surface. In the photo below you can see a piece of blue tape with a mark on it. This was used to identify the edge of a panel plus a 3/4″ inter panel gap. I simply marked off the dimension on a 2×4 and used it for a gauge. Next, I installed the inverters/trunk cables. The plan here was to extend the terminated trunk cable at the top of the 1KW array using Enphase Engage Couplers (part #ET-SPLK-1 shown below) and 4 conductor TC/ER cable. Once extended to the second to leftmost new rail, Engage trunk cable would resume and run up, then across to right side of the second set of racks, then down and across to the left side of the third set. Using this strategy, only one unused connector would be needed. Then, we mounted the panels and called New Berlin for our final inspection! By the end of May, the array was producing 3.5KW! I think its important to make one final point here. What made installing our 4KW array simple and quick was my initial rafter survey. As with any project, careful planning and design work is essential, and this project was no exception. To determine my optimum rail and panel layout, I first went up into the garage and precisely measured the distance between all rafters along with the exact size of the roof itself in millimeters. Using this and panel dimensions from the Suniva cut sheets, I created a precise roof layout using my drafting tool of choice, Home Plan Pro. Once everything was entered, I was able to play around with panel mounts until I had an optimum layout. I wouldn’t want to even think about an installation such as ours without doing this essential, up-front survey work. So what was the bottom line? Stay tuned for my next post! It’s started! I got an estimate for $8,850 yesterday and am meeting with our contractor on the 25th to submit my down payment/go over logistics. We will be using the same panels/inverters/mounting system and once again, I’ll be doing the majority of the work. My contractor will handle materials, WE energies related documents, permits, and electrical hook up. I’ll do the Focus on Energy rebate paperwork which has begun again at the same price point ($700/KW installed). It looks like the Federal Govt. will be continuing their 30% tax writeoff too which should bring my installed costs down significantly.